Fleas are a persistent pest that makes life difficult for pets and their owners. While there are hundreds of different species of fleas, they all share the same common traits: they feed on blood, spread disease, and can be incredibly difficult to get rid of. 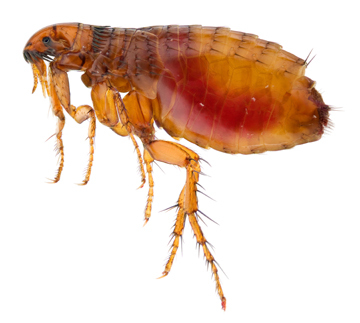 If you have a flea problem in your home, contact the Keller flea control and extermination experts at Integra Termite and Pest Control. Fleas have four stage they go through during their life cycle – egg, larva, pupa, and adult. Most of the eggs are laid on an animal, and those that do not stick fall in pet beds, furniture, etc. Eggs typically hatch within one week, and tiny larva emerge. After approximately one week in the larva stage, they spin cocoons to begin the pupa stage, which can last from one week to up to a year. Once the flea leaves the pupa they live out the remainder of their lives as an adult. If fleas are making your family or pet miserable, contact Integra Termite and Pest Control. With over 23 years experience in flea control and extermination in the Keller area, our knowledgeable and dedicated technicians use only the safest and most effective solutions to get rid of unwanted pests.